Improve your Corvette's rear view with the C3 Corvette 1968-1973 Rear License Bezels. These triple chrome plated bezels are guaranteed to look great on the back of your Corvette. They are sure to turn some heads due their unique design and flair. They are shiny and durable, made to look and feel their best. Installation is quick and easy, saving you time and money. 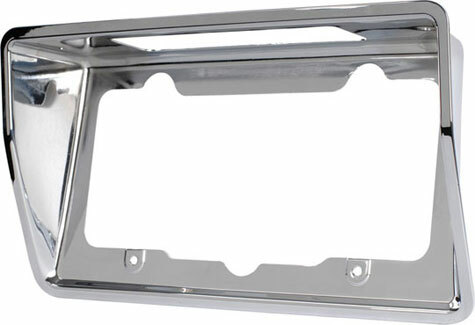 Give your license plate a beautiful home for everyone to stare at with the Corvette Rear License Bezels. Q: Hello good day Do you send this to Europe? What will be shipping costs? Q: Is this show quality or driver quality?